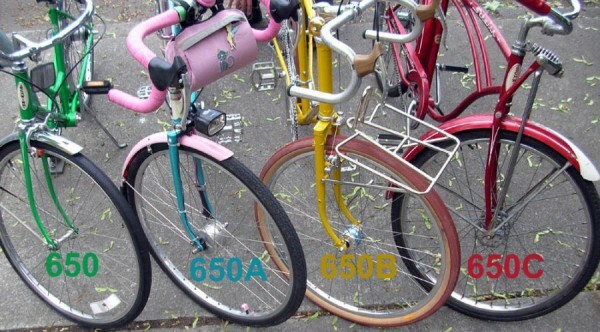 Four “650” tire sizes — photo thanks to Aaron Goss of Aaron’s Bicycle Repair. http://sheldonbrown.com/650b.html : added more info on “27 five” tires, and a photo (thanks to Aaron Goss!). This entry was posted in Updates and tagged bicycle, ETRTO, ISO, shelbroco, Sheldon, Sheldon Brown, sheldonbrown, sheldonbrown.com, sizes, tires, tyres. Bookmark the permalink.